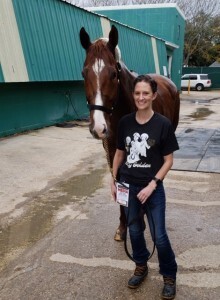 Editor’s Note: Holly M. Smith is a young lady that we got to meet a couple of years ago, when she was daylighting/moonlighting/working at Churchill Downs and honing her craft and professional hobby of being an equine photographer. What we found out quickly is that Holly has a great eye. What we found out most is that Holly has a great heart. She does what she loves. And, she loves what she does. And, it shows in her personality. It shows in her work ethic. It shows in her desire to capture the moment and capture the horse. Most of it, it shows in her photos — that capture them both. Here’s another look at Keeneland, through the eyes and lens of Holly M. Smith. This one on Saturday, April 13 and for a master day of major stakes events and top racing horses. I just love this feature. Because I love photos of Thoroughbreds, too.